We love the LED Clock Fan, it keeps us cool and looks cool. 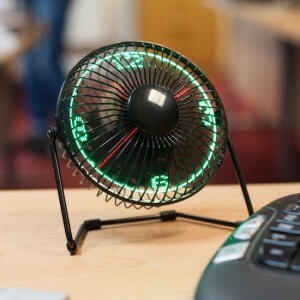 The USB operated LED clock fan is the perfect accesory for your desk at work or at home. A high quality metal structure with 360 degrees rotation, the bright LED tells you the time while the fan keeps you cool. Easy to setup, plug it in, set the time and away you go.